Guitarist Milos Karadaglic presents a personal choice of music. With pieces for guitar and wide range of classical music, including Tchaikovsky, Rachmaninov and Shostakovich. 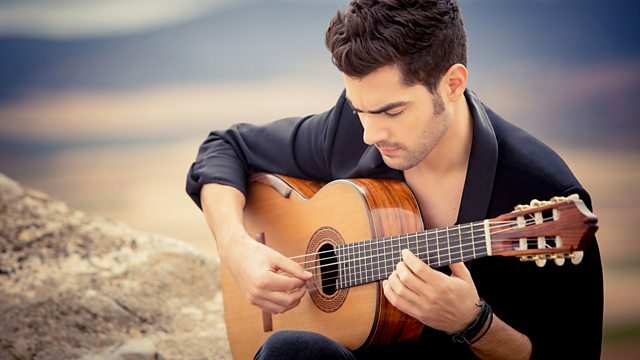 The young Classical guitarist Milos Karadaglic has topped the classical music charts around the world, and has been compared to the legendary John Williams and Julian Bream. He presents a personal choice of music that has inspired him, and describes how his musical tastes dramatically expanded when he left his native Macedonia to study in London. Milos chooses not only music for guitar but a wide range of classical music, including the Russian greats Tchaikovsky, Rachmaninov and Shostakovich. Performer: John Williams. Performer: Julian Bream. Conductor: Mstislav Leopoldovich Rostropovich. Performer: Maxim Vengerov. BMG : 09026 61450 2. Conductor: Yannick Nézet‐Séguin. Performer: Rotterdam Philharmonic Orchestra. Performer: Maxim Vengerov. Orchestra: London Symphony Orchestra. Conductor: Mstislav Leopoldovich Rostropovich. Conductor: Riccardo Chailly. Performer: Martha Argerich. Performer: Berlin R S O.. Performer: Martha Argerich. Orchestra: Berlin Radio Symphony Orchestra. Conductor: Riccardo Chailly. Conductor: Sir Antonio Pappano. Performer: Angela Gheorghiu. Performer: Orchestra of the Royal Opera House, Covent Garden. 50999 2 17441 2 9. Orchestra: Orchestra of the Royal Opera House, Covent Garden. Conductor: Sir Antonio Pappano. EMI : 50999 2 17441 2 9. Conductor: Andrea Marcon. Performer: Philippe Jaroussky. Performer: Venice Baroque Orchestra. Singer: Phillipe Jarrousky. Orchestra: Venice Baroque Orchestra. Conductor: Andrea Marcon. ERATO : 50999 9341302 2. Conductor: Gustavo Dudamel. Performer: Yuja Wang. Performer: Simon Bolivar S O. Conductor: André de Ridder. Performer: Daniel Hope. Performer: Konzerthaus Kammerorchester Berlin. Conductor: Yannick Nézet‐Séguin. Performer: Miloš Karadaglić. Performer: London Philharmonic Orchestra. Orchestra: London Philharmonic Orchestra. Conductor: Yannick Nézet‐Séguin. Performer: Miloš Karadaglić. Music Arranger: Stephen Goss.